Since the reunification of East and West Germany in 1990, Berlin has been searching for its place as the new capital of a rediscovered nation. 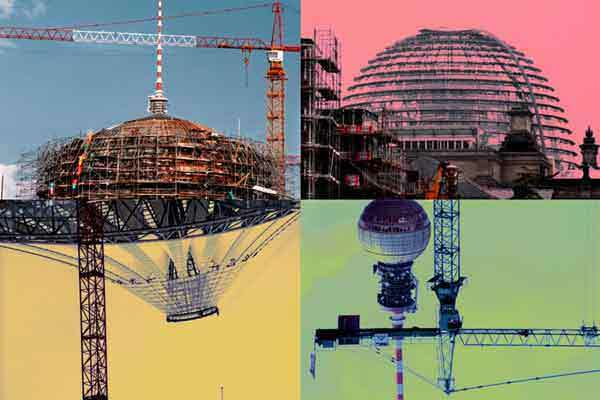 In their efforts to present Berlin as a political and cultural European metropolis comparable to cities such as London or Paris, national and local authorities have undertaken a vast and ambitious program of construction and reconstruction. This has had some rather dramatic financial consequences. “Berlin-Mitte” (the centre of Berlin), which had become something of an urban wasteland because of the famous Wall, has undergone a staggering transformation over the past 10 years. The “Potsdamerplatz” and its surroundings have changed the face of the centre of Berlin to an incredible extent. Visitors to Berlin from around the world are attracted to the Sony Centre, the architectural focal point of the s new landscape. 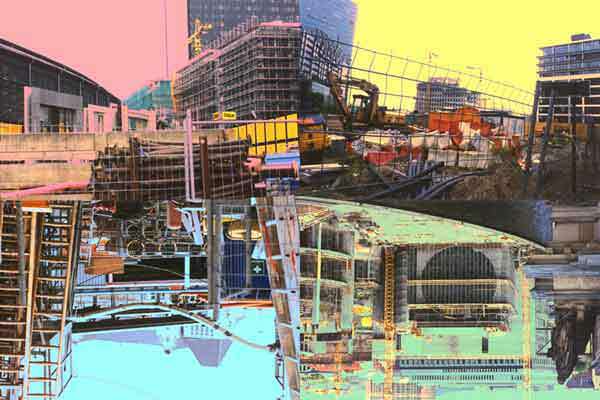 In this series of 12 works, the artist has juxtaposed or contrasted images of this new Berlin in construction, using four photos to create original urban scenes. 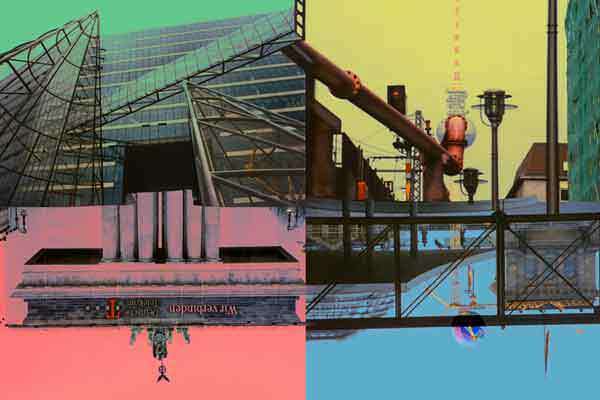 One can find striking contrasts between the old and the new city as well as ironic architectural dialogues. 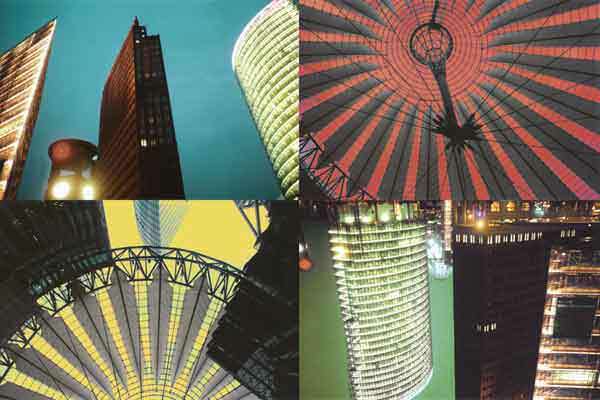 During the summer of 2002, hjm has created four large new compositions (180cm x 1830cm) for an exhibition in Berlin. 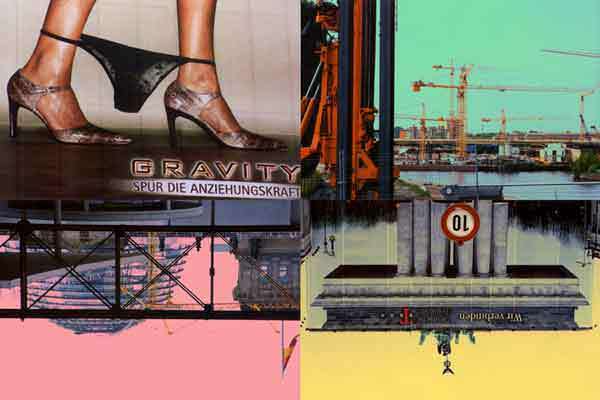 Although they are collages of steel structures, fragility breaks through – terror and natural catastrophe threatening whatever mankind may build up. 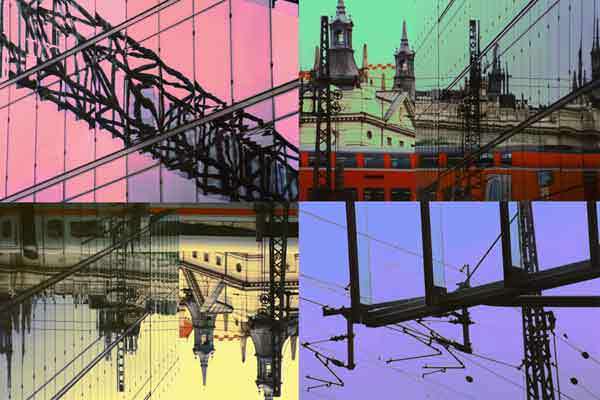 Beyond the interesting structures and appealing colours the photographs hide unspoken messages. The spectator is left to discover and interpret them as he or she pleases.